California Governor Jerry Brown recently signed into law AB 1419, a bill proposed by Assembly member Susan Talamantes Eggman (D-Stockton) that would expand the options for the recycling of cathode ray tube (CRT) glass, found mostly in now obsolete televisions and computer monitors. CRT glass was once easily recycled into new CRT’s. However, the demand for new CRTs has collapsed as the television and computer market has shifted to digital flat screen technology which have grown in popularity. Because of rising costs, negative economic incentives and strict regulations in states like California, some CRT processors and recyclers are choosing to store the glass indefinitely rather than send it for recycling or disposal, which increases the risk of mismanagement and/or abandonment of CRTs. CRT’s are hitting the trash heap in huge numbers, creating large stockpiles at recycling centers and scrap waste yards around the state. Panel Glass which is low and non-leaded panel glass. “Currently, cleaned panel glass must pass three tests in California to be deemed non-hazardous, per Teresa Bui, a legislative and policy analyst at Californians Against Waste (CAW), the bill’s sponsor. The toxicity characteristic leaching procedure (TCLP) and the soluble threshold limit concentration (STLC) tests are used to determine the leachability of the panel glass. A third test, known as a total threshold limit concentration (TTLC) test, is used to determine the concentration of a number of substances. The existing state regulations limit the options for recycling this glass to smelting, glass-to-glass recycling to produce new CRTs, or landfill disposal. The main problem is that the market for CRT glass is shrinking. 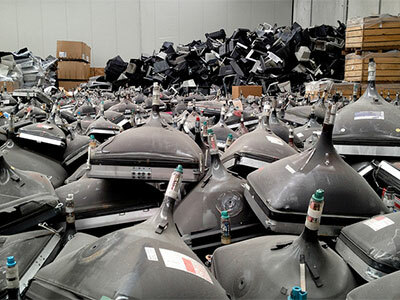 Videocon a company based in India is the last manufacturer of CRTs and uses as much as 57 percent of the scrap funnel and panel glass disposed of in California, but it’s unclear how much longer they will remain open since the demand for the products CRT’s is non-existent. California’s strict environmental laws while helping to clean up the state, are causing an issue for recycling companies in this case. “Right now, the barrier recyclers are facing is that they can clean the glass and pass the federal tests, but when it comes to California’s test, the barium level is too high,” Bui said. AB 1419 allows scrap CRT panel glass to be used in many new products where it is determined to pose no harm, including tiles, fiberglass, bricks and cast concrete. The bill also allows state agencies to identify additional end-uses of the material, and to prohibit any previously allowed uses if needed. “The e-waste recycling industry is struggling on dual fronts with record low commodity markets and lack of allowable end-uses for CRT panel glass,” said Teresa Bui, senior analyst for Californians Against Waste, the sponsor of the bill. “AB 1419 will help open up recycling markets in California, and reducing stockpiles and the need for extracting raw materials.” AB 1419 passed the legislature with bipartisan support and enjoyed support from local government, environmental groups and the state’s recycling industry.